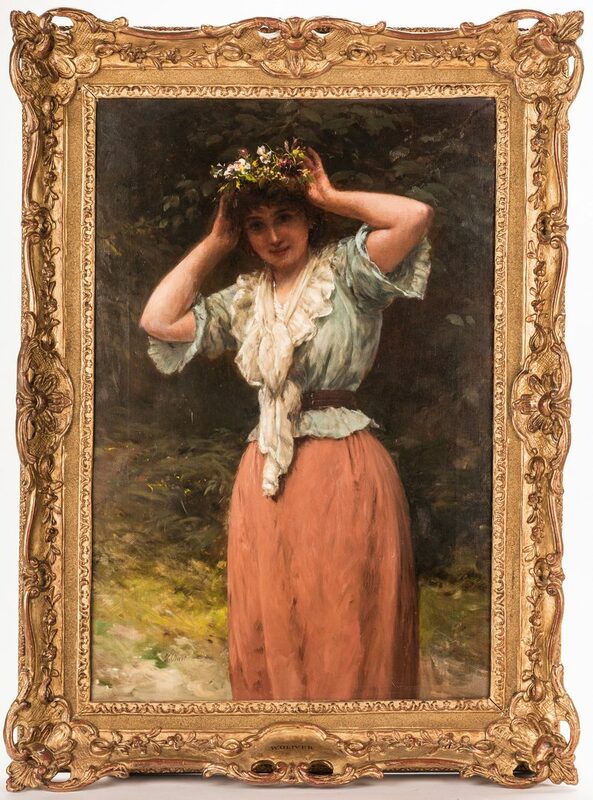 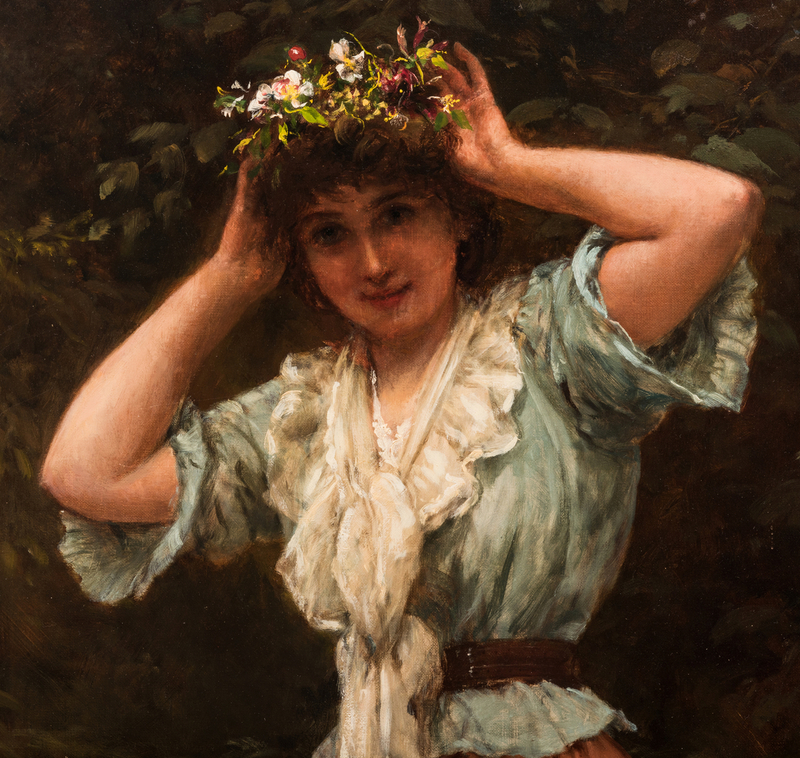 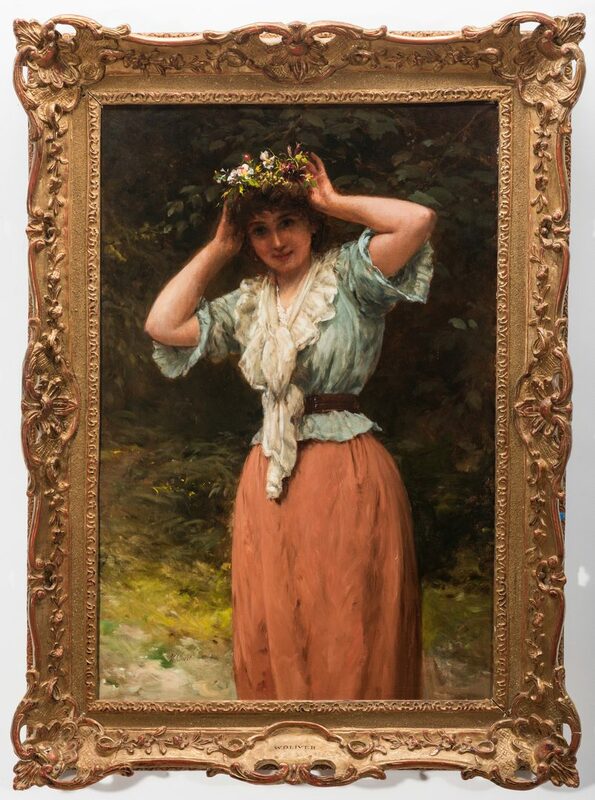 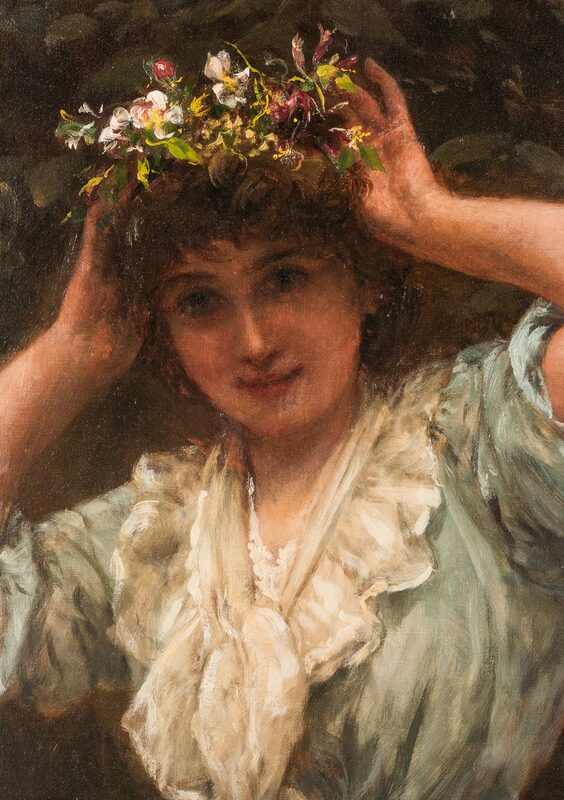 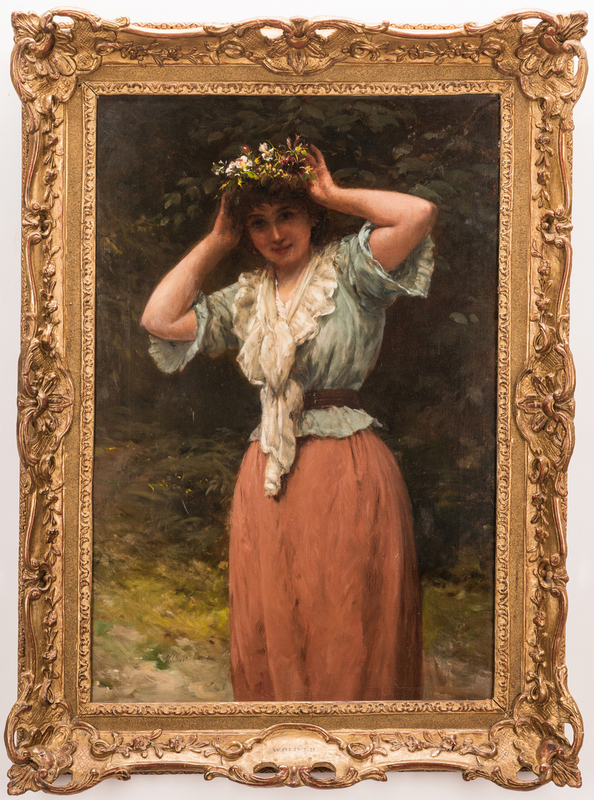 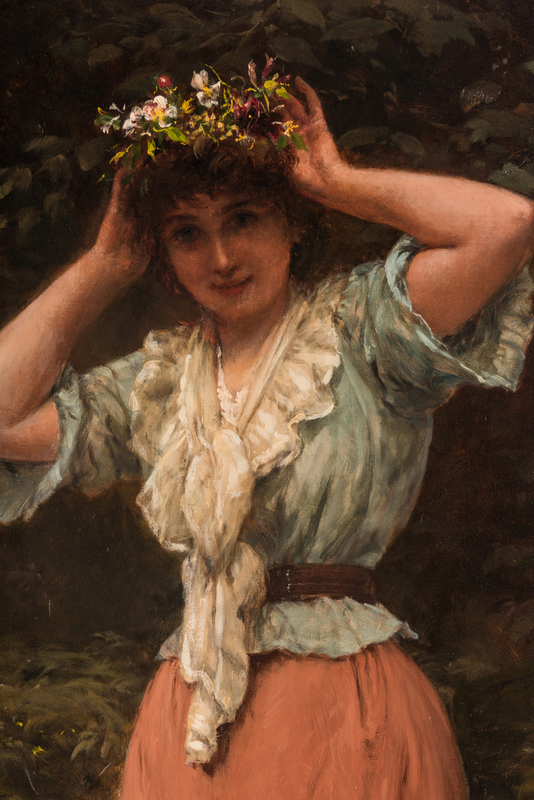 William Oliver the Younger (France/United Kingdom, 1823-1901) oil on canvas painting depicting a young woman in a wooded landscape setting, adjusting a wreath of flowers in her hair. 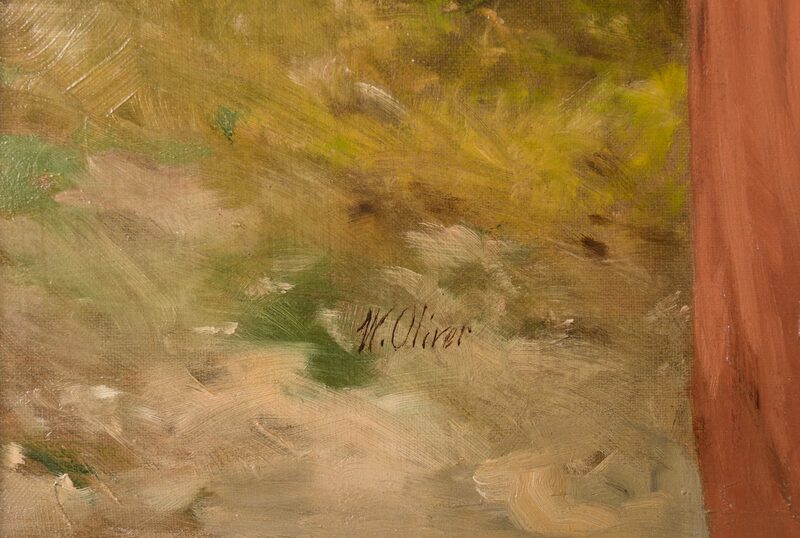 Signed "W. Oliver" lower left. 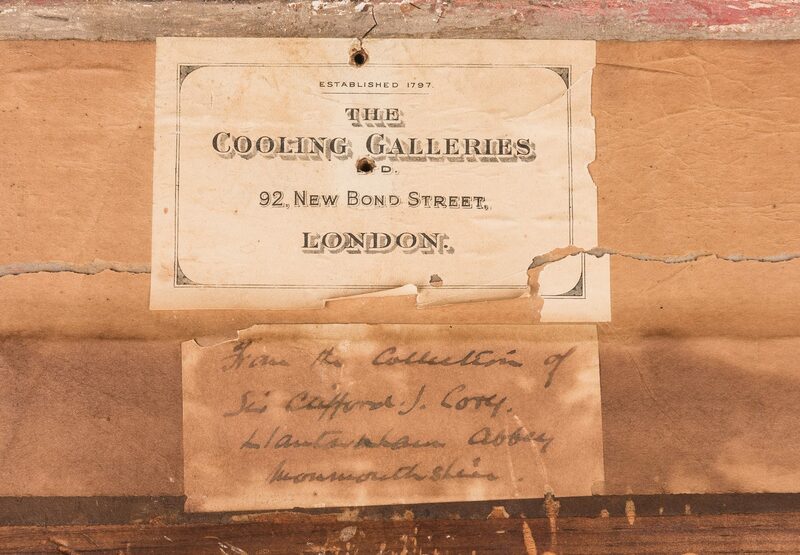 Handwritten label reading "From the Collection of Sir Clifford J. Cory, Llantarnam Abbey, Monmouthshire" with The Cooling Galleries, London label, en verso of frame. 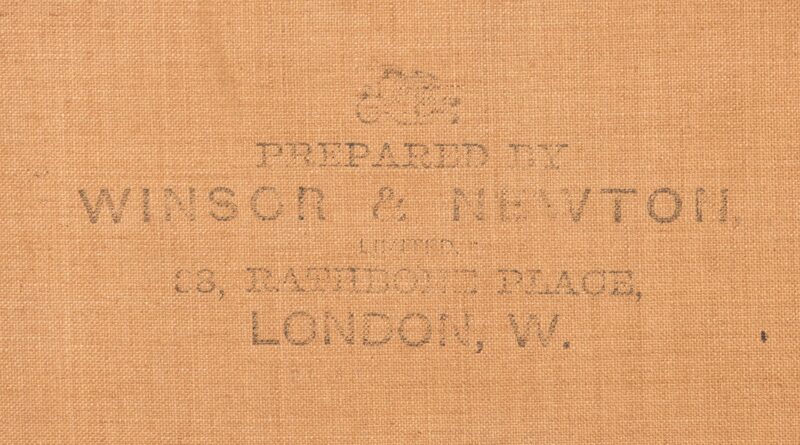 Stamp reading "Prepared by Winsor & Newton, Limited, 33, Rathbone Place, London," en verso of canvas. 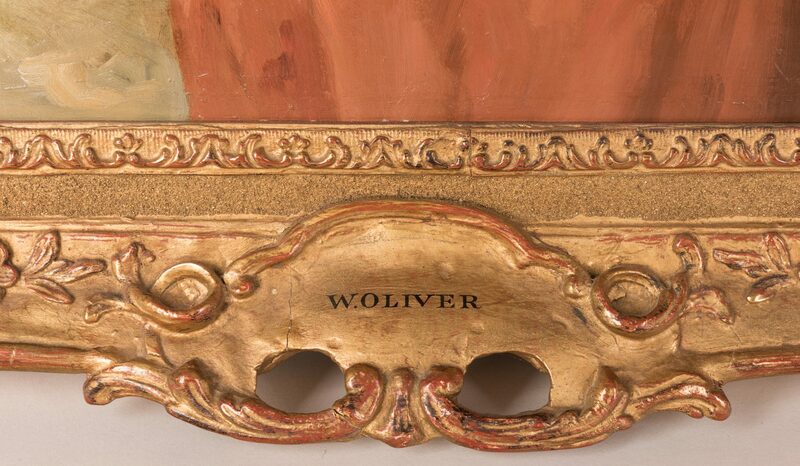 Housed in a carved Louis XV style giltwood and composition frame with pierced corners, labeled "W. Oliver" lower center of frame. 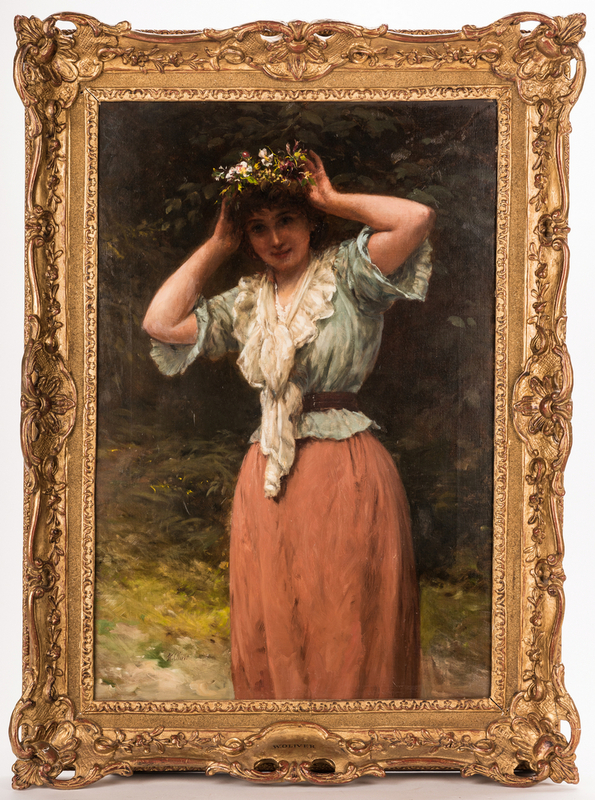 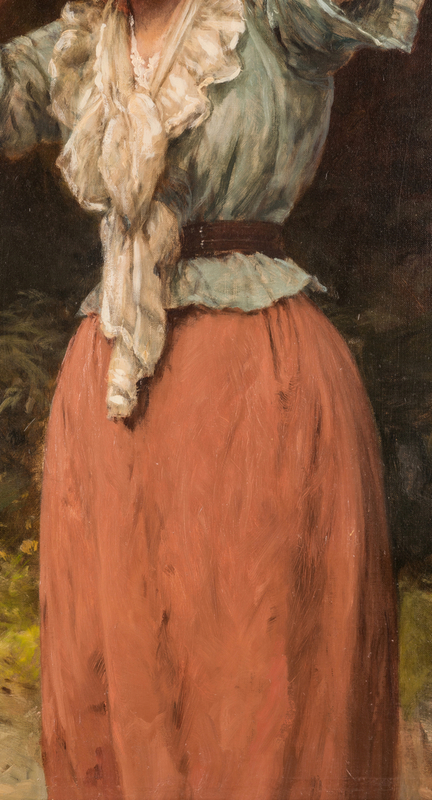 Sight – 29 1/4" H x 19 3/8" W. Framed – 37 1/4" H x 27 1/4" W. Provenance: Property of a private Alabama collection. CONDITION: Overall good condition. 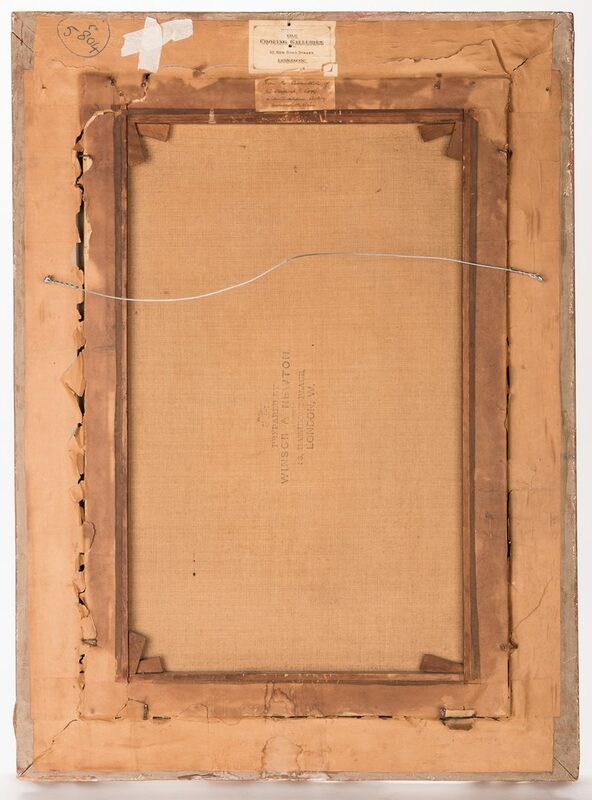 Frame abraisons with minor paint loss, largest 1/4", to top left and right edges of canvas. 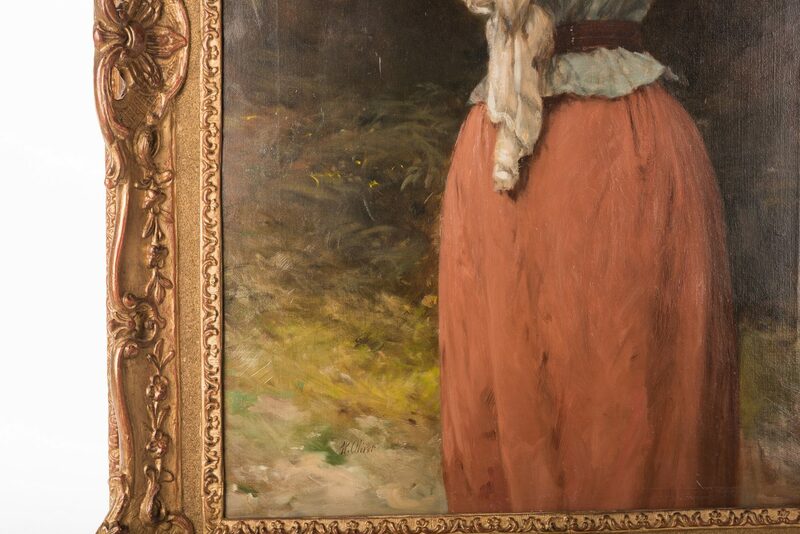 6 faint horizontal scratches to left side near female's arm. 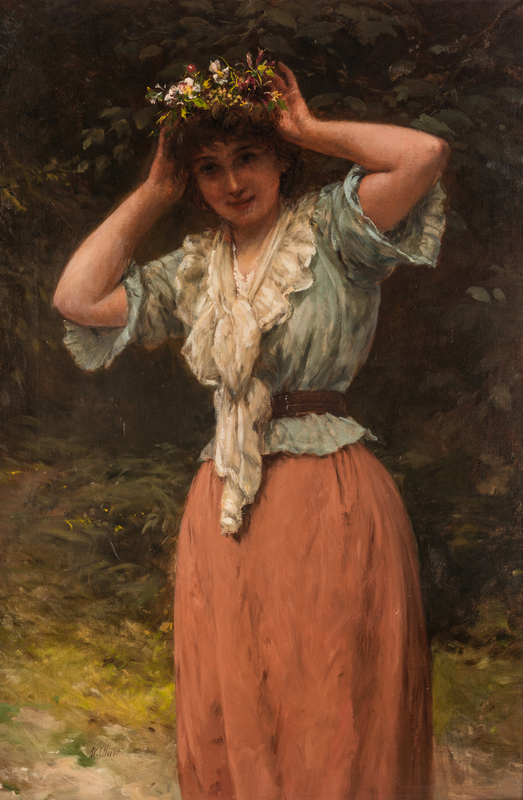 Faint strecher marks visible to perimeter. 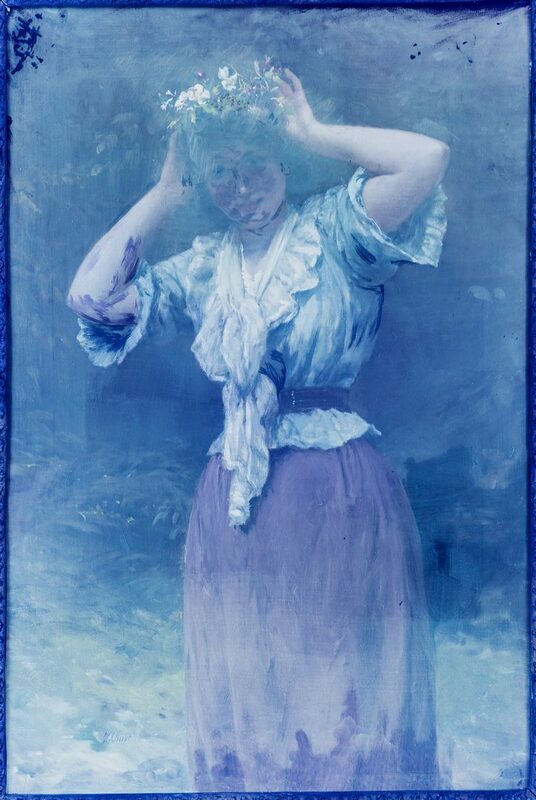 Several areas of inpainting visible with black light: 2"L x 1" W area top left corner; 1"L area to right of skirt; 3"L x 2"W area on left arm and sleeve; 1 1/2"L area center of blouse; scattered inpainting to right arm and in background near top. Female's face possible old cleaning and retouching (see black light photo).